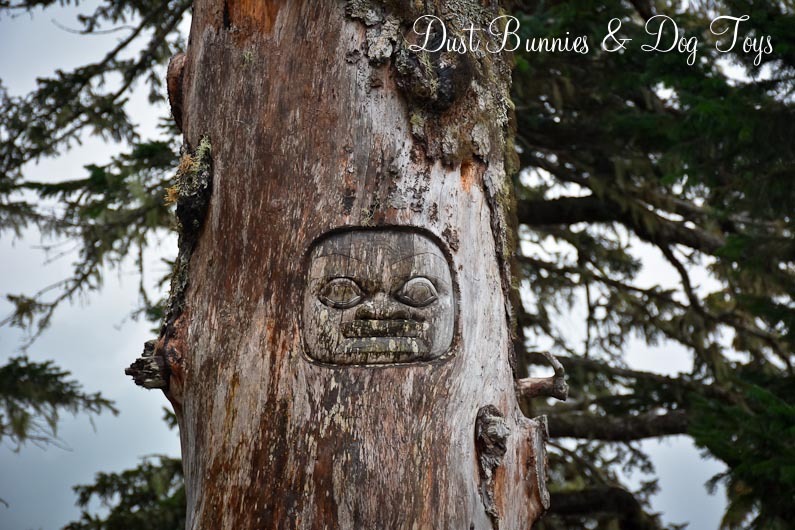 Sorry for the delay since my last post – that little thing called life threw a few curve balls at me and I was so busy swinging away at them that I didn’t get back to sharing the rest of our Juneau adventures. But I’m back now and I’m going to wrap up the story of our adventures this weekend. So without further ado- here’s the next installment! 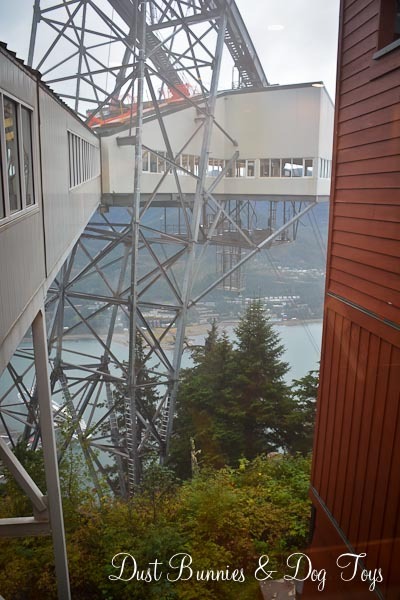 This was my third trip to Juneau and I was determined to ride the tram up the hillside before leaving. Although I originally planned this activity for my day off so we could enjoy lunch at the Timberline restaurant at the top of the hill, I discovered they would be closed for a private event that day. Since visiting the restaurant was a main part of my desire to experience the tram, we decided to go after I finished my work events and have dinner instead. 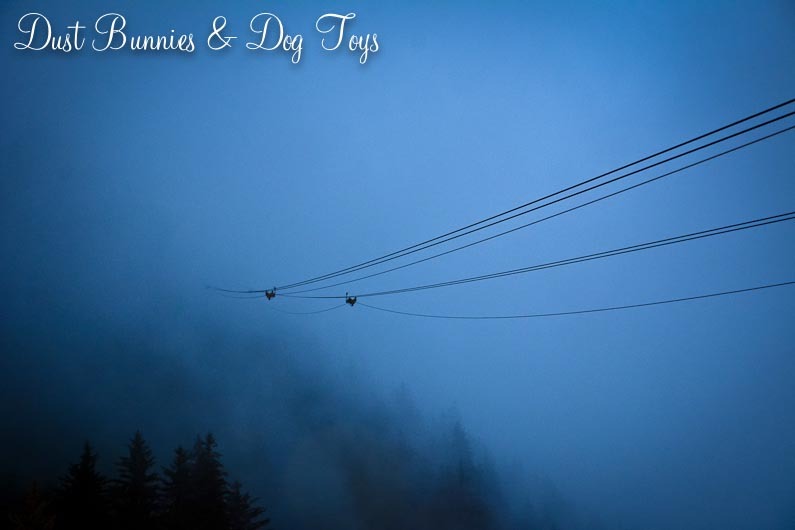 I’m not sure if it was the foggy/drizzling weather or the fact that it was the end of the tourist season, but there was no crowd and we had the entire tram to ourselves except for one other person. Once we climbed into the fog bank the view of town was gone, but that made specifically aware that we were at tree top level. We arrived at the top terminal and made our way down the hallway to the gift shop. It wasn’t until looked out a window at where we’d come from that I realized just how impressive the structure really was. 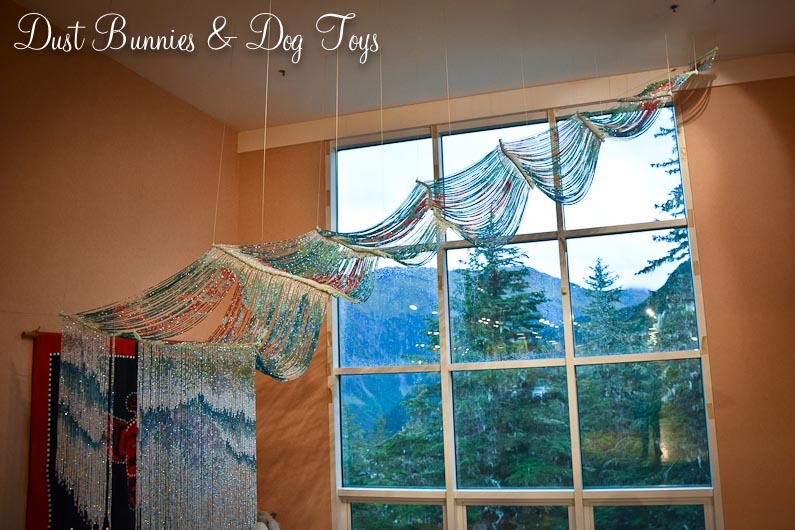 We browsed the gift shop where several pieces of local art were displayed, including this amazing beaded river, which hung from the ceiling! Once we’d finished in the gift shop we headed outside on the trail around the building to catch a few sights before the light faded. Just outside the terminal was this amazing overlook, which provided a stunning view now that the fog had parted. 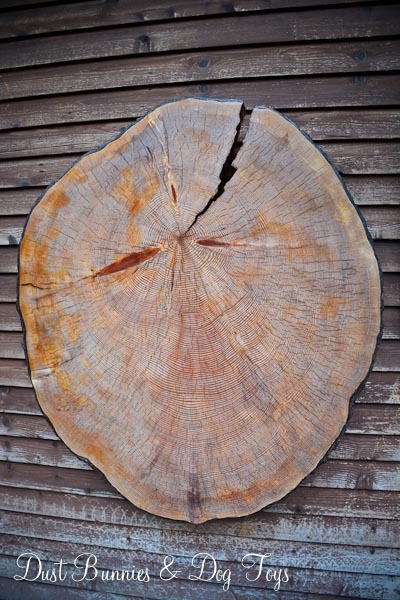 A nearby outbuilding had this massive tree slice on display. 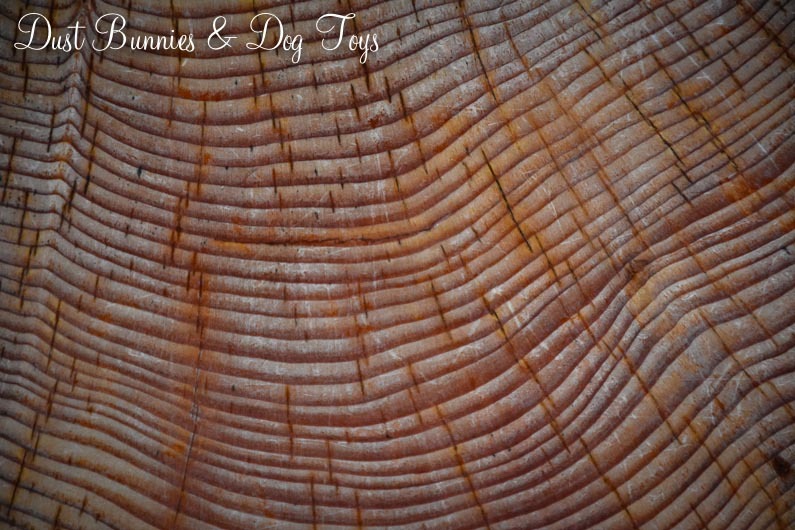 Those rings depict a LOT of history – 168 years worth to be exact. 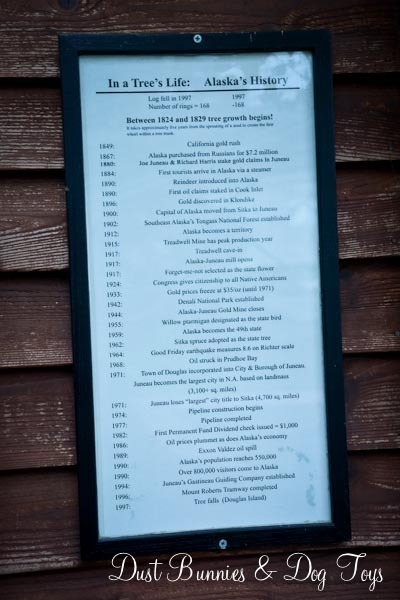 The sign next to the slice noted major events in Alaska history coordinating with different rings. 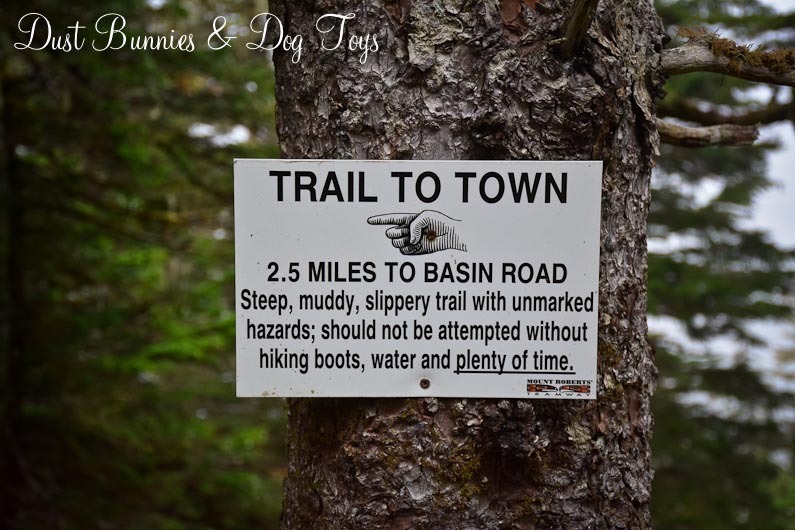 The trail was pretty slick and we weren’t dressed for hiking, so we wandered the well traveled areas around the buildings. 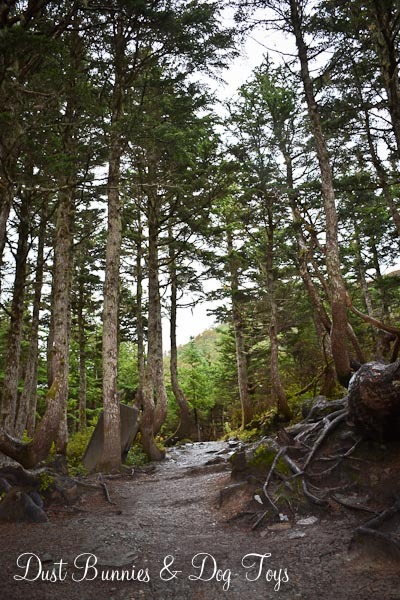 Several of the trees had this amazing bend in their trunks, which signs explained was from heavy snowfall when they were young. 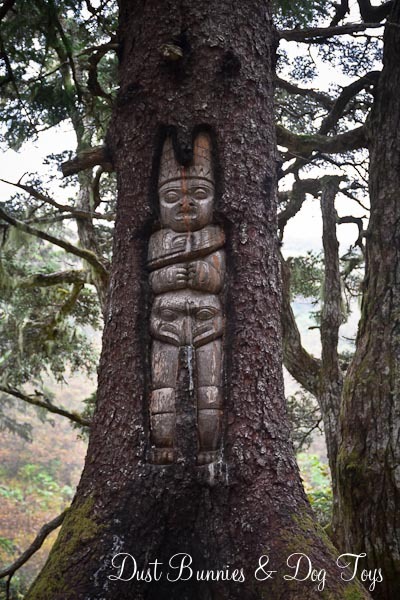 We spotted several native carvings in the trees along the path. There were no descriptions of what they symbolized, but they were still pretty cool. 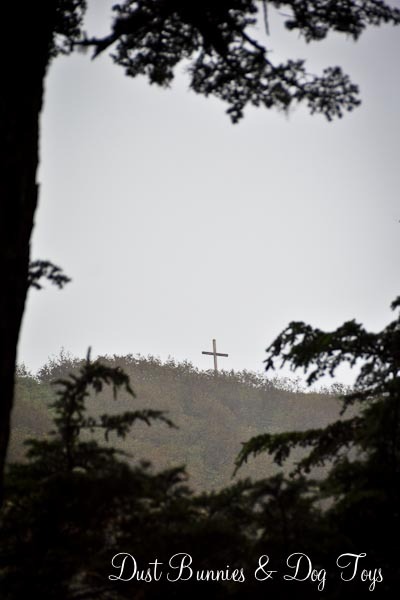 We also noticed a cross on the hilltop beyond the trees. It was interesting to consider the difference in these belief systems and how they’ve finally found a peaceful mix – which has not always been the case in these parts. As the light faded we spotted the sign pointing out the trail back to town. Obviously for those more adventurous and prepared, so we decided to head inside and test out the restaurant. Inside we visited the theater, which shows a short film on the history of the native people of Juneau and the many settlers who came to the region before it became a state. 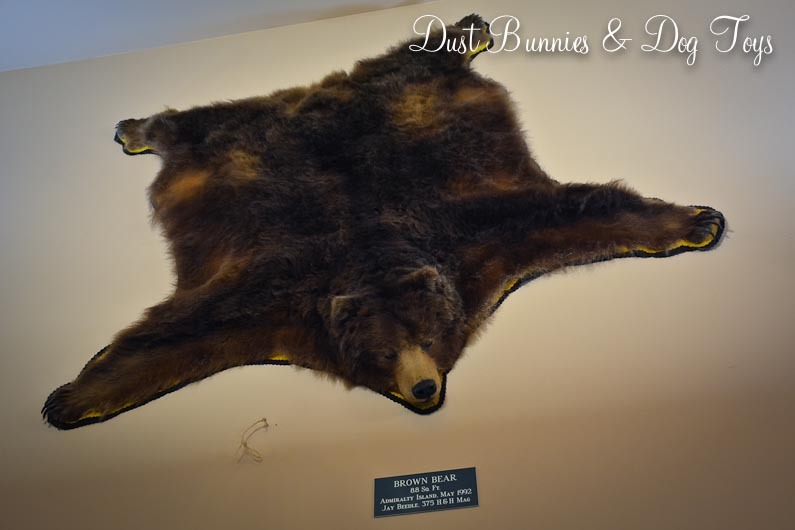 After that we checked out some of the hunting displays. The CEO of the company I work for is from Juneau and has many ties to the community, so it wasn’t that surprising to see that several of the trophies were donated by his brother! We ordered crab nachos and watched the fog roll back in as we waited for our meal. 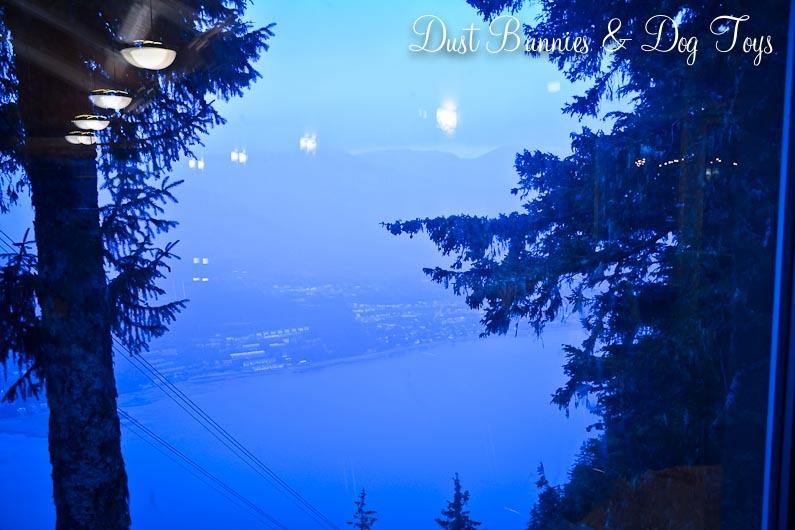 I’m sure on a clear day this is one of the best views in town! 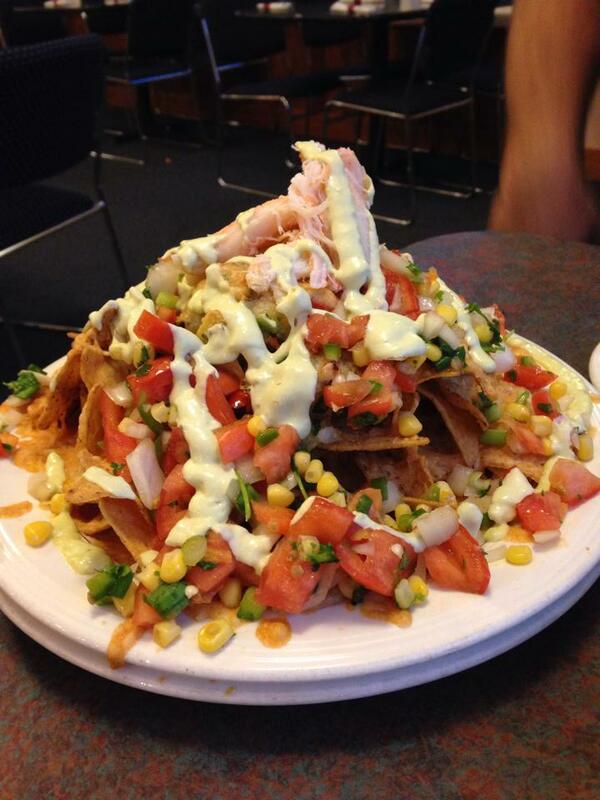 Although the nachos weren’t the best we’d ever had, they were massive. Literally, a pile of chips, cheese, tomatoes, and onions topped with crab meat. Needless to say, we didn’t finish the entire plated. It was almost closing time we we moseyed out to the tram terminal and took the last tram of the night back down. As we walked back to our hotel through the drizzle I looked back and realized the entire building on the hillside had been cloaked in fog once again, making it appear as if the cables disappeared into the clouds. 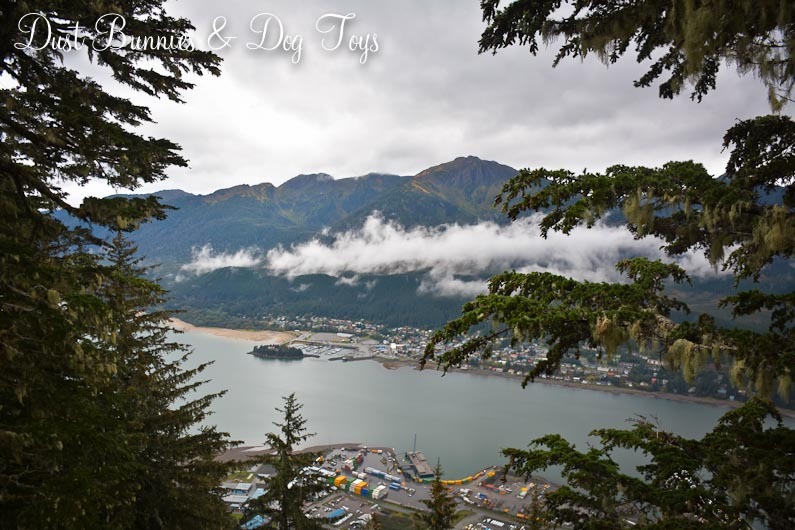 It certainly wasn’t the experience portrayed in the brochure, but it was still one I’d recommend to those who visit Juneau, even if the weather isn’t perfect.